Since I’m working on migrating all my theme settings to the Customizer I thought I’d start a tutorial series on how to create your own settings. In this tutorial I’m going to be building custom settings into a Twenty Twelve child theme, but of course you can use your own custom theme. First thing first: we need to create a new PHP file. This is where we’ll be adding all our code for the Customizer. I like to put this file inside of /inc/customizer/. It might seem silly to put it in a /customizer/ folder since we only have one file. But I typically go for a subfolder if I’ll be including other custom controls (which I won’t be in this tutorial, but will be showing in later ones). * Include our Customizer settings. * Add custom sections and settings to the Customizer. * @copyright Copyright (c) 2016, Nose Graze Ltd.
// All our future code will go in here. You don’t have to use a class, but I prefer it since I think it makes things feel a bit more organized. Inside of our class, let’s build out the constructor. The constructor only needs to do one thing: hook into the customize_register action. This references a method called register_customize_sections() so let’s create that next. This is where we’ll be creating new sections (and panels, if applicable) in the Customizer page. // New section for "Layout". An ID for the section (in my case, 'blog_layout'). 'title' — Title of the section. 'description' — If you want a description to appear below the title, enter it here. 'priority' — This determines how high up on the page the section appears. Lower number = higher up; higher number = towards the bottom. This adds a new section, but if you refresh the page, nothing will actually show up. A section won’t show up until it has at least one setting inside. So let’s do that next. This calls a new method that we’ll need to do next. I like to split off the settings for each section into their own methods for organizational purposes. So let’s create that next. We’ll be adding all our “Blog Layout” settings inside this method. We’ll need to use that $wp_customize object again, just in a slightly different way. First I’ll be adding a checkbox option. 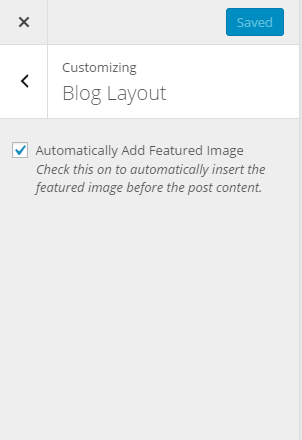 This option will let you decide whether or not you want the featured image automatically inserted before the post content. We’ll tackle these one at a time. Setting first. This looks similar to add_section(), huh? We have two parameters: an ID and an array of arguments. The ID is important because you’ll be using it when we add the control and you’ll be using it whenever you want to retrieve the setting from the database. default — The default setting. For a checkbox, this will either be true (checked on) or false (unchecked). sanitize_callback — The name of a function for the input to pass through before it gets saved. In this case we’re passing through a sanitize_checkbox() method in this class to make sure only “true” or “false” can be entered. We’ll create this method later. Now let’s create the control directly below this. Eeks, a few more settings here. label — Title of the field. description — Description of the field. section — ID name of the section to put this field in. This is the 'blog_layout' section ID we created before. settings — ID of a setting to attach this control to. This needs to be the ID we set in add_setting() earlier. type — What type of field this is. The WP_Customize_Control documentation has a list of possible fields, including text, checkbox, radio, select, dropdown-pages, and textarea. priority — Just like in add_section() this controls how far up or down the page the setting gets displayed. Now let’s go ahead and create a new method for that sanitization callback. This just needs to make sure that we can only accept ‘true’ or ‘false’ as values. * Accepts only "true" or "false" as possible values. // New panel for "Layout". * Add settings to sections. If you check out the Customizer, you can now see the settings show up. You can check or uncheck the checkbox, save, and have the settings automatically saved. But they don’t actually do anything yet. You have to use them in the theme somewhere for them to take effect. I’m going to copy the entire template into my child theme so I can override it. Those end up being the same thing since get_theme_mod( 'auto_add_featured_image', true ) will always return true or false. If the checkbox is unchecked, then we’ll get false back, the condition will fail, and the the_post_thumbnail() line will never run. Adding colour pickers to the “Colors” section. We’ve covered checkboxes, but let’s talk about adding new colour pickers to an existing section, “Colors”. 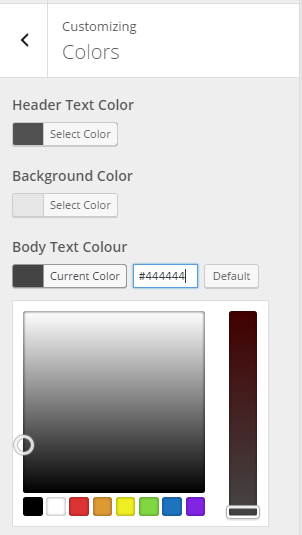 Now let’s add a new colour picker in there, perhaps for changing the colour of the paragraph text. Set the default to a hex colour value. Make sure the sanitize_callback is set to sanitize_hex_color' — this should always be used for colour pickers. Make sure the section is 'colors'. Make sure all your setting IDs match up. If you refresh the Customizer, you’ll see the new setting pop up in the “Colors” section. But once again, changing the colour value doesn’t actually change anything on the site yet. We have to add in code to make that happen. First, hop over to functions.php and create a new function. * Generate CSS based on the Customizer settings. Now we need to get the value of the 'body_text' setting and create CSS from it. Use get_theme_mod() to get the value of the setting. The first parameter is the ID of the setting and the second is your default. Use that value to generate CSS and append it to the $css variable. return $css at the end. This function creates all the CSS, but we still need to add it to the <head> area. * Add the parent Twenty Twelve stylesheet to the front-end. The first parameter is the ID of the stylesheet. You can change this to match your own. The second parameter is the name of the CSS function we just created. If you want to see my finished code, you can download my Twenty Twelve child theme. This contains all the code we’ve gone over in this tutorial. Welp, you read my mind! I actually thought to myself the other day that I wish you would make a tutorial on this because I couldn’t quite figure it out from the other ones I’ve read. Thank you so much! You’re welcome! 🙂 I have more advanced Customizer tutorials coming up later! Thank you a big big time !!! 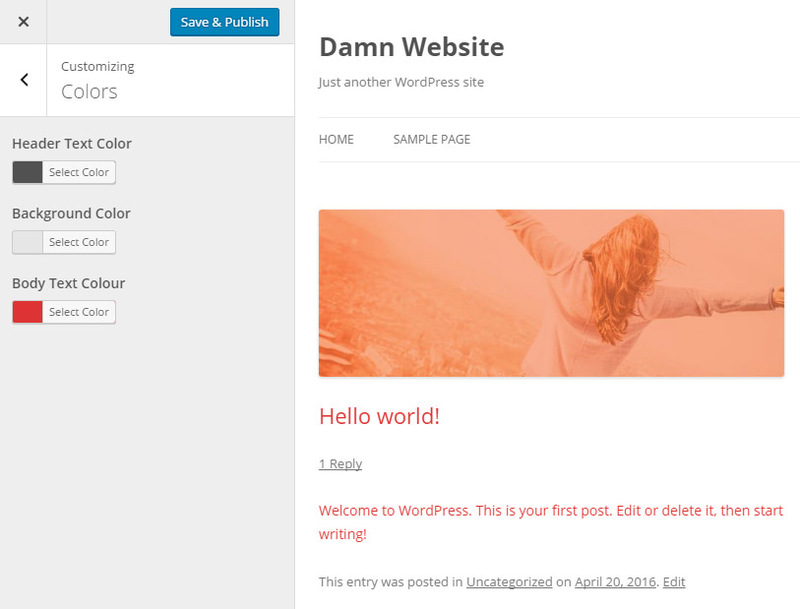 input about using customizer to add settings to your wordpress theme. I will follow these tips. Your expertise always helps me tremendously. Maybe I am living under a rock, but what is this customizer thing? Appearance > Customize. 😉 It’s the settings panel that’s already built into WordPress. 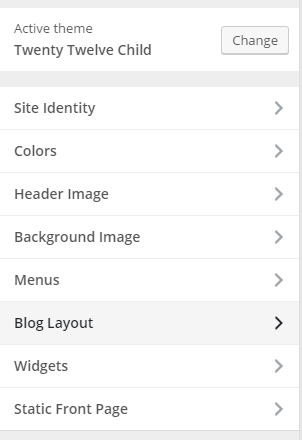 All themes in the WordPress.org repository are required to build their theme settings into that rather than creating their own custom “Theme Options” page (as Tweak Me v2 does). Your tips sound really very helpful to the WordPress developers. Though, I am not a developer, but sometimes I have to customize the WordPress themes. Hope this article will help me. So, I want to add another property to the colors section. I want to be able to change the background color of the .site-title class. I thought I was doing it right, but I’m not sure, because it’s not working. I have a different question now. How would I _remove_ a theme customizer option… or at least rename it. For example, in twenty twelve, there’s an option for customizing the header text color. At the very least, I want to rename that to “Site Title Color.” Ideally, I’m trying to set up a system where the user selects 3 colors, and they populate various CSS parameters of the site (one of which would be site title). I think I know how to do that once the colors are selected, but if that Header Text Color option is in the Colors section, it would be confusing. Very helpful, very easy to understand, thank you and love your tut so much. Hi and thanks for a nice turtorial, I can see you have great UX approach and inviting logic in this post. (Maybe we need more girl-power on the web). As a developer from the WordPress beginning, I can see that the customizer API is gonna explode, and we can use the API in many areas, not only layout purposes. I was google around to find a simple answer of the ‘sanitize_callback’ called within a plugin. Many fancy topics about the customizer in search results only uses the Theme functions.php to implement the code. You actually go straight forward and show us how to use the customizer within a class. Thats pro! Thanks, and keep posting, I will follow!